American Sewer Services Employee with Gun. Photo from City of Milwaukee. The City of Milwaukee has released a photo of the latest contractor to be caught carrying a handgun at a city job site. The weapon was spotted in a photograph taken as part of a routine inspection of a job site by a representative of the city’s Department of Public Works. 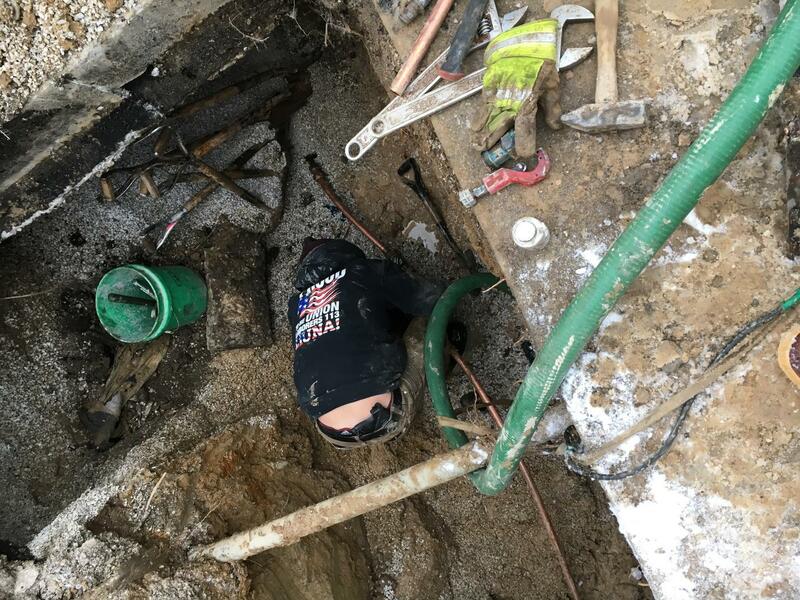 The work, a replacement of a lead service line with copper piping, was being performed by embattled-contractor American Sewer Services. Urban Milwaukee broke the news on January 30th that another American Sewer employee was caught with a gun. The news comes less than two months after two high-profile incidents involving employees of the city contractor drew the ire of city officials. Three employees were photographed openly carrying handguns on November 30th and a city resident spotted a cooler with Ku Klux Klan and Confederate Flag stickers at an American Sewer Services job site on December 8th. The most recent incident took place in the 2700 block of N. 35th St. That area is part of the 15th Aldermanic District represented by Alderman Russell W. Stamper, II. The alderman also represents the area where the first gun incident took place. Stamper has been one of the most outspoken critics of American Sewer and has stated that if the company can’t be debarred from performing work for the entire city, he would like to explore banning them from working in his district. “After meeting today with Commissioner [Ghassan] Korban, I have informed him that I am withdrawing our recent winning bid on the latest lead replacement project. In not accepting this award, we will be forfeiting another approx. $500,000 contract. When combined with other recent actions taken by the Commissioner, this brings the total ‘fine’ we’ve paid for these three incidents to nearly $1.5 million,” said Biondich via email. Following the prior incidents, American Sewer employees were banned from carrying weapons on city job sites. City workers were already banned from carrying weapons, but a loophole in city contracts allowed contractors to carry weapons. The city has moved to explicitly ban on-site weapon possession in future contracts. Biondich has yet to appear before the full Common Council, sending a low-level employee in his place in December. Multiple members of the council characterized the move as “disrespectful.” In a statement, Biondich cited health issues as the reason for his failure to appear and agreed to meet with council members one-on-one. The Common Council opened a formal investigation into American Sewer which grants the investigation’s chair, Ald. Robert Bauman, subpoena power to compel Biondich’s appearance. When the investigation was opened on the 17th, Bauman said he would confer with his colleagues to decide if and when they could compel Biondich to appear. Still waiting for Milwaukee Bucks privilege black man video. Blue lives matter. Awesome! Little lead will do a body good! The time is long past for the state to require liability insurance from every CCW Holder. Its amazing the right wingers are Pro-Life…..